During the long interval after the Commission began its work and the Opinion in 1954, entomologists naturally continued to use the butterfly names with which they were familiar. It was during these years that V. Nabokov made many contributions, especially concerning the Lycaeides distributed in North America. When discussing what should now be called L. idas he used the name “argyrognomon,” not invalid for much of that time, but after the announcement of Opinion 269 in 1954 the position changed radically. 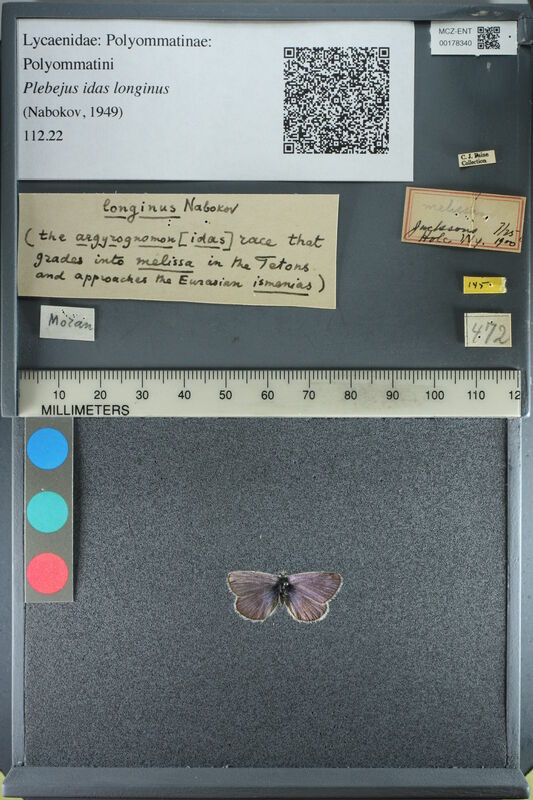 The name was restricted to a newly identified European butterfly. Applied to any other species (i.e. L. idas) would be to create a misidentification, and to use it so must be entirely against the rules. Here is an example of the ambiguity to which Higgins testifies. It is the type species of a race of L. idas, since reclassified as Plebejus idas longinus, collected by Nabokov in Jackson Hole in 1949 (before the Opinion). You can see that he labeled it argyrognomon [idas], apparently uncertain of which name was the proper one. In this case, then, Nabokov has taken a name invented by Kirby and, via a chain of appropriations and discoveries by various scientists, applied it to his own discovery in a different setting. And this seems appropriate, given the equally topsy-turvical relationship between Kirby and the various literary transmutations presented in Kinbote’s note. Beautiful connection that perfectly chimes in with the novel’s mischievous play on its title (mis-)quote. “Pale Fire”s tendency to appropriate all sorts of art and life into Kinbote’s “creation” really encompasses (or at least plays into) each and every facet of the text, its fictional author, and also the real life of Vladimir Nabokov and his butterflies.